At Tropical Pools and Pavers, we pride ourselves in offering ONLY the best pool equipment available in the market today. That is the sole reason we install Zodiac® products. 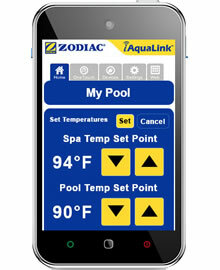 Zodiac’s AquaLink® Controls are designed to manage programed times based on seasonal needs. Already an iAquaLink user? Access your pool here. Monitor & adjust all equipment controlled by the Zodiac AquaLink pool control system. iAqualink on the goThe iAquaLink Web Connect Device is a configurable system that can be accessed anywhere internet connection is available. It’s an ideal system to control your pool, spa, sprinklers, salt water system, and much more anytime, anywhere. Monitor and adjust all equipment controlled by the AquaLink system.